Application deadline January 24, 2014! As part of the USA Islamic Fashion Week, DMV 2014 we are excited to launch MY GREEN HIJAB Fashion Design Competition. This competition will provide an opportunity for you, the Muslimah Fashion Designer, to design a garment in a socially responsible manner, and will demonstrate your concern about the environment and the footprint we leave behind. This Eco Friendly competition will challenge the designers to use items that are headed for the recycling or the garbage and your creativity to transform them into a fashionable Islamic garment. All entries must fit within the guidelines of the Modesty Defined Islamic Fashion Council of America, MDIFC, for modest and Islamic wear. 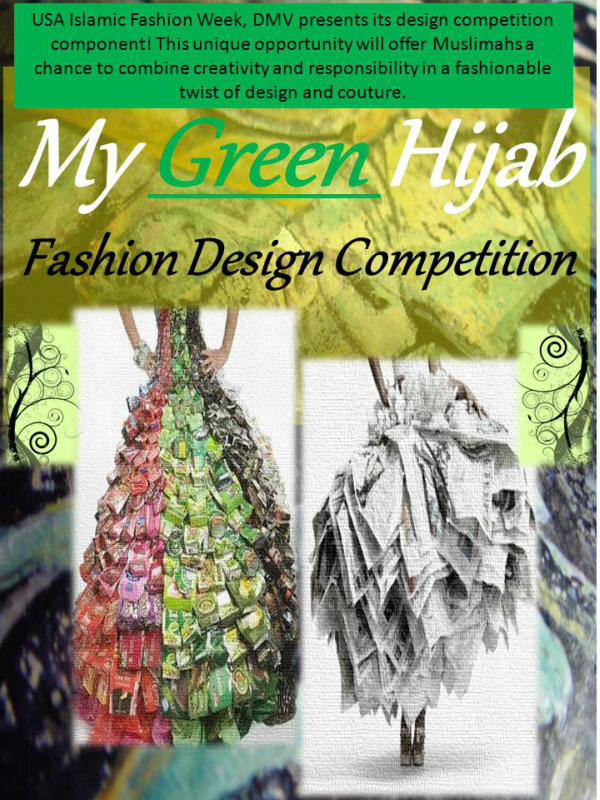 The winner of MY GREEN HIJAB Fashion Design Competition will receive a monetary prize and immediate showcase opportunities in the USA Islamic Fashion Week, DMV 2014. Participants in MY GREEN HIJAB will have the opportunity to have their design showcased at USA Islamic Fashion Week, DMV 2014. The designs will be judged and the 1st, 2nd and 3rd place winners will be announced at the show. Registered designers will construct garments February 14th at the USA Islamic Fashion Week, DMV 2014. Designers must bring all materials needed to complete their garment. Each completed garment will be showcased on February 15th where the 1st 2nd and 3rd place designs will be announced. For more information about Modesty Defined Islamic Fashion Council of America, LLC and the inaugural USA Islamic Fashion Week, DMV Click here. 1. Must currently live in the USA. 2. Must be Muslimah and at least 18 years old. 3. Must construct a garment made entirely out of recycled items excluding any recycled clothes or processed fabric made from recycled materials. 4. Must bring all items to be used in the construction of the garment. 5. The garment must include a head covering. 6. The garment must adhere to MDIFC’s official organizational definition of Islamic attire. For more information Click here. 7. Submit the sketch of the garment and what the garment will be constructed of by February 7, 2014. 8. Sketches should be submitted via email to komita@mdific.com. Subject line: MY GREEN HIJAB. 9. Constructed garments must be made of items that are safe for you and the model. 10. The garment must be sturdy enough for the model to walk down the runway without falling apart. 11. The use of recycled items derived from cigarette or alcohol by-products or packaging are prohibited. 12. A fee of $50 paid to MDIFC via PayPal with or in advance of submitted entries. What recycled items are acceptable? An item that is headed for or found in the trash or recycling bin that is no longer needed for its original purpose including but not limited to plastic bags, newspaper, candy wrappers, paper bags, bottles, bottle caps, toilet paper rolls, etc. Can I purchase recycled items? No items can be purchased for main the construction of the garment except notions such as but not limited to thread, glue, tape, staples, etc. What will the winter receive? The winner of the competition will be awarded a monetary prize, the amount to be determined, and an immediate showcase in USA Islamic Fashion Week, DMV 2014. Yes. Designers are required to remit a payment of $50 with or in advance of submitting their sketches. Payments can be made online via Paypal or by check. Should I use a fashion template? You are not required to use a specific program. Drawing can be either a flat rough sketch, a fully rendered fashion illustration or a computer generated technical sketch. Can I include other items in the picture, even if I am not submitting them for the competition? No. Submission should only include the exact garment to be duplicated if selected. Yes, however based on submissions we will do our best to respond in a timely manner, insha’Allaah. To expedite this process we ask that you follow up via email to komita@mdifc.com. Please do not call regarding the competition if you have not yet received confirmation of your submission within 1 (one) week. What should my designs look like? What should they reflect? Except as it pertains to a descriptive idea of modest attire in the Qur’an and Sunnah, at MDIFC we are not married to any particular persuasion nor description of an “Islamic” garment. Using this description we have created working guideline and definition for what MDIFC will use in categorizing Islamic wear. Your garment must meet these guidelines for consideration in this competition. Click on the link in this statement to view our definition. Do my sketches need to be in color? No, your sketches do not need to be in color. However we encourage the use of color so you can better convey your creative vision. If not, then clearly label color and choice of recycled or reusable materials. Remember, sketches look best in a light grey or white background. No, this competition is only open to American-based designers.